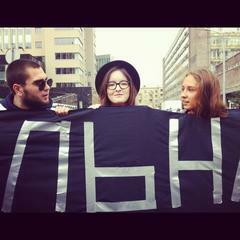 "Existential Russia" protesters in Moscow, Sept. 15th 2012. Generation Putin: stories exploring politics and everyday life for Millennials in the former Soviet Union, is produced by the Seattle Globalist and comes from PRX, the Public Radio Exchange, with financial support from the Open Society Foundations. Produced by Jessica Partnow, Sarah Stuteville and Alex Stonehill. Armed with a letter from 1990, producer Jessica Partnow goes in search of her childhood Soviet pen pal. Audio postcard from DIY punk music festival in Almaty, Kazakhstan. A Generation Putin *extra*: Audio postcard from a military jeep ride in the former Soviet stronghold of Balaklava, Ukraine.